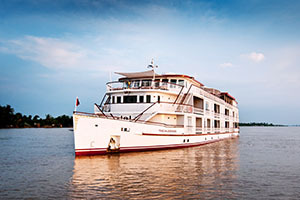 Transfer to welcome lounge followed by welcome drink while your information is being processed for boarding then continue by overland to My Tho for, embark your luxury floating home to explore the mighty Mekong. 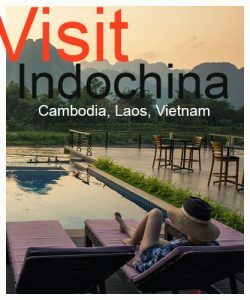 The ship sails passing peaceful creeks, villages and natural islets towards the anchor spot for an overnight near the charming rustic town of Cia Be, famous for its floating market and Catholic French Church. Enjoy the pleasant leisure on your private balcony to capture beautiful sunset over the Mekong or join the tea time at the open bar. You may like to watch classic movies at lounge cinema or enjoy yourself. Rise early to experience an invigorating Tai Chi class before the buffet breakfast is started to serve. Your Mekong Delta tour is start with Cai Be exploration, learn from your tour guide about the floating market animated by special trading activities, observe rice paste, rice paper, rice cookies and rice wine also is manufactured, and you have chances to try its famous coconut candies while the local boat excursion takes you see the lush canal network and admired by farming activities in the fields. Return to our ship for lunch while the journey slowly slides towards Sa Dec where we take a traditional local boat to visit the largest island “Binh Thanh”, we wander through the village to unlock daily lifestyle, culture and interact local people as well as practice the mat weaving if you wish to try it. 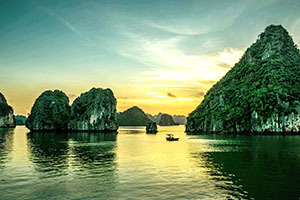 Return to the cruise for relaxation by the pool before the tour guide gives a presentation on the “Life on the Mekong Delta” as the ship continues sailing to Tan Chau – the border town to Cambodia. Anchor and overnight near Tan Chau. After breakfast, we discover the pleasant town of Tan Chau with a sizeable Chinese, Kinh and Khmer community, stroll around to see interesting workshops and challenge your bargaining skills. Next, we embark a local boat to explore the region, pass floating houses to visit the floating fish farm, observe fish production and get a deep insight on how fish farming works. 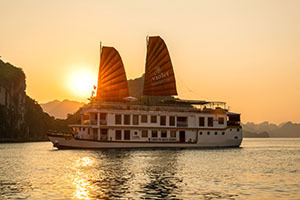 Return to our cruise, sails to Vietnam-Cambodia border and it’s time to enjoy yourself on the sun deck as the cruise glides through the deep Cambodian countryside towards Phnom Penh. The cooking demonstration is offered for you to get understand the local cuisine and join our afternoon High Tea for sweet treats before you totally drift away in relaxation. Enjoy the dinner on board before the ship arrives in Phnom Penh Capital. 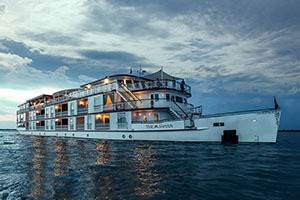 Have your own free time or pop of out the ship to see the evening highlight of Phnom Penh Riverside or you may like to walk around for a chilled cocktail in a colorful bar.